PLAXIS 3-D is in my opinion the current available best 3-D geotechnical software and can be used for just about all geotechnical problems. It has great soil models ranging from Mohr Coulomb to soft soil creep model which is very accurate for offshore geotechnical problems in soft clay. Despite the sophistication geotechnical software, it is still rather user-friendly. 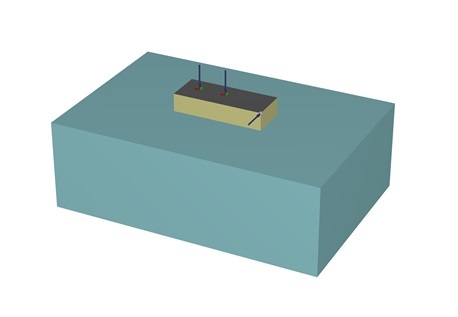 A 1 m high foundation with extension of 2 x 5 m is placed on clay with a constant undrained shear strength of 5 kPa with elastic module of 300x5 kPa. A surface load is placed on the structure and a point load is applied one of the upper corners. The horizontal load and create both overturning and torsion. This is included in the classic bearing capacity assessment where I have utilised NC = 6.17. Since it mainly is sliding problem, then the bearing capacity factor does not have a major impact on the calculation. The problem is illustrated below. I did not experience creating the structure to be very easy since this was my first attempt ever to use the software. With some experience, I believe it will be rather easy to create the structure. When you delete elements, loads and so on, I experienced the software broke down a few times. Luckily, my model was automatically saved each time. 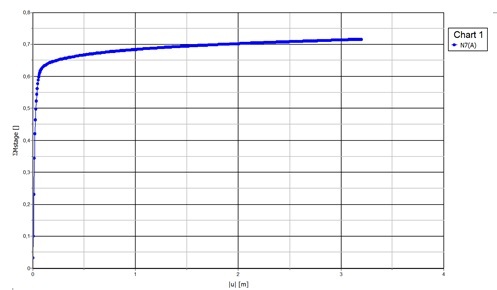 For the given problem, the displacement and load diagram does not predict a pure plastic behaviour. Failure is therefore defined at the end of the elastic behavior. 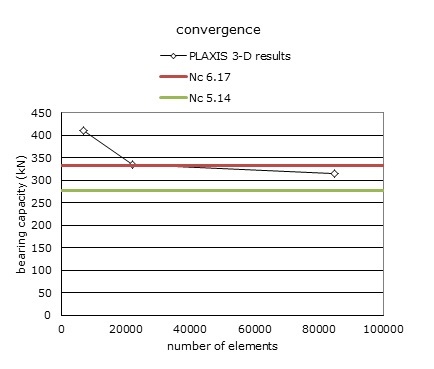 This is the major challenge with PLAXIS 3D, that it is a finite element analysis software and predicting the ULS load is always mesh dependent and step depending. It is therefore not possible to accurately determine if the collapse load has been identified. An example of the displacement and loads diagram is given below. 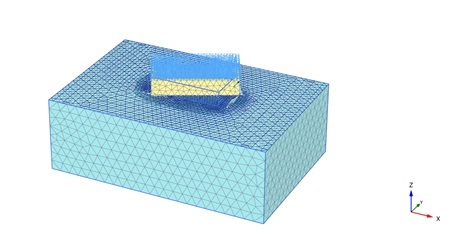 PLAXIS 3-D has a number of great tools to illustrate the results. It is possible to gain a great overview of the displaced mesh, cross sections can be made to identify slip lines in the soil, it is possible to see plastic points and finally the displacement load diagram can easily be plotted. A relatively large discrepancy is found between the horizontal load applied compared to the static equilibrium equation proposed by brinch Hansen. It would therefore be necessary to run and analysis with tension cut off to investigate if a more refined results and the PLAXIS 3-D analysis can be obtained. At the same time, the equation proposed by brinch Hansen may be on the conservative side. PLAXIS 3-D has been used to compared to the results of a static equilibrium model proposed by brinch Hansen for torsional loaded foundations. 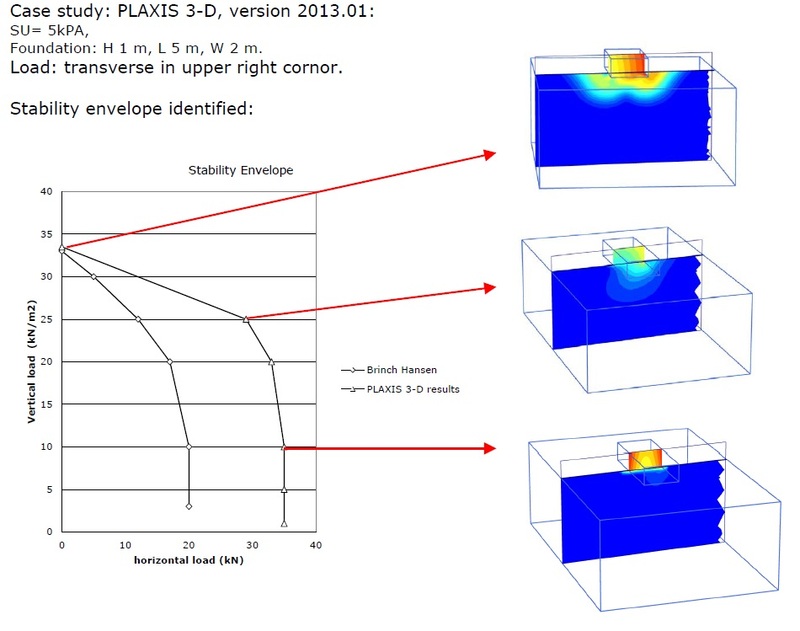 PLAXIS 3-D has found to be relatively easy to use. It is a very comprehensive software and substantial geotechnical experience is required to get the full benefit of the software. Also, it is not a software usually expect to get good results from without some experience with finite element modelling in PLAXIS. The steps required to build and run a model are logic and easy use. Some PLAXIS experience is still required to make sure you will obtain a good and accurate model. As always, it is important to understand the results expected when you got the model and test the sensitivity. Also, since the software is based on Elasto plastic material behaviour, the displacements in each step are assessed and this is very time-consuming. When the ULS needs to be determined, it would be more practical with a limit analysis approach to obtain better precision in the results and a faster analysis. The best features are the soil models and the presentation of the results. The geotechnical engineer with some experience of failure mechanisms should easily be able to identify if the results are good with the graphics of the failure mechanism. All in all, I think that PLAXIS 3-D is the best current software available on the market for the most complicated problems.